Financial Regulation 18 sets out the rules for competition (including exemptions) and circumstances when further advice or Director of Finance consent is needed. Regulation 18 also addresses how offers are to be invited and dealt with. The table below sets out the required purchasing procedures for different levels of spend. The expectation is that, where the required goods are available, purchases up to £25,000 will be made via the Marketplace or under a Framework Contract. Other offers should not be sought, unless better value can be achieved elsewhere, in which case Procurement Services must be notified so that any price discrepancies and inclusion. Total Value1 is the contract value or estimated value as follows. For a fixed period contract it is the total price to be paid or which might be paid during the whole of the period. For recurrent transactions for the same type of item it is the aggregated value of those transactions in the coming 12 months. Where the duration is uncertain it is the monthly payment x 48. For feasibility studies it is the value of the follow-on scheme. Aggregated value of separate contracts meeting a single requirement. Competitive Quotes: Quotations in writing, including fax or email. 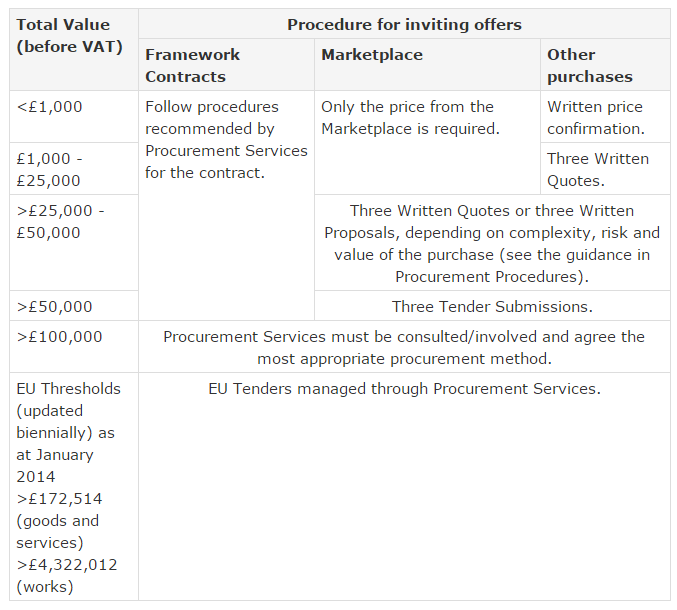 Competitive Proposals: Written bids submitted by a specified date. Competition procedures are applicable unless a dispensation has been granted in accordance with Regulation 18.3. This will only be granted when justified reasons are given and approval from Director of Finance has been granted, in consultation with the Head of Procurement (prior to any commitment to purchase is made)2. This request should be sent to the Head of Purchasing for verification of the request and approval to be granted. An exemption form can be downloaded for completion from Procurement Services website. Purchase of or repairs to goods or materials, including machinery or plant, available only as proprietary or patented articles. 1In considering these values it is important to remember that it is the aggregate value of a contract which is considered e.g. the appropriate value for a five year £20,000 contract is £100,000, not the annual £20,000 cost. For definition, see Financial Regulations Schedule 2.